The Clifton Food Range provides professional chefs with sous vide equipment - developed and manufactured by Nickel-Electro, a brand leader in temperature control laboratory and science equipment. 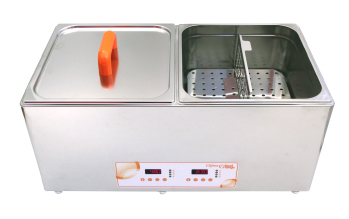 Nickel-Electro has adapted its range of scientific application water baths to develop the Clifton Food Range of Water Baths, which offers users sous vide equipment with unparalleled specific temperature control to produce consistently perfect results. What is sous vide cooking? Sous vide - which literally translates from French as 'under vacuum' - was originally developed in France during the early 1970's. The process evolved when a chef and a university food scientist joined forces to devise a method for perfect foie gras. The best method proved to be sealing the food in a pouch under vacuum before slowly cooking it at a controlled low temperature. With the right sous vide equipment the gentle cooking process results in tender textures and enhanced, intense flavours, which are now part of every serious professional chef's life. What Is Molecular Gastronomy? A concept originally introduced in the 1980's, Molecular Gastronomy recognises the correlation between science and cookery. 'Slow cooking' is an important part of Molecular Gastronomy, due to the excellent flavours and textures which result. Clifton Food Range takes great pleasure in introducing the space-saving, clamp-on immersion circulator, the latest addition to their market leading sous vide cookery appliance range. 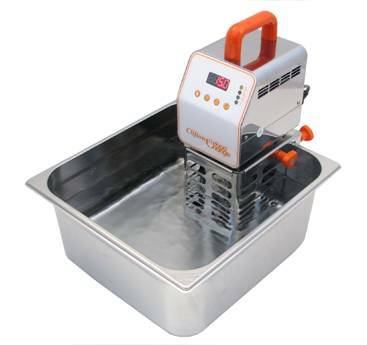 It is ideal for chefs who only need a circulator occasionally or simply require portability. The design has been sanctioned by professional chefs and can be fitted in seconds to a standard gastronorm tank or round straight-sided vessel of up to 50 litres (diameter 40cm). And being small in size, it is easily stored. Using the same high precision controller found on all other Clifton Food Range products, accuracy and repeatability are guaranteed. Actual temperature is displayed clearly to the accuracy of 0.1 °C and the integrated timer can be set between 1 minute and 99 hours. There is audio/visual notification once the set time has elapsed and temperatures can be easily and rapidly set with the push button, wipe clean control panel. The entire case is constructed from high quality stainless steel and the heater and stirrer mechanism are completely surrounded by a stainless steel cage, preventing contact with pouches. The stirring propeller is manufactured from stainless steel and therefore virtually unbreakable. The cage can also be quickly removed to assist cleaning. If the water drops below the recommended minimum level or the unit is inadvertently switched on without being immersed in water, 'FILL' appears on the display as a visual alert and both heater and stirrer are immobilised. Clifton Food Range takes great pleasure in introducing their new 14 litre digital duobath, which is designed for sous vide and low temperature cooking in the professional kitchen. This latest model has two 14 litre chambers, built specifically to operate at two different temperatures simultaneously and with two different liquids e.g water in one side and oil in the other. The 14 litre duobath will also minimise counter top use, as the drain taps are conveniently located at the rear of the bath. The bath includes a run-dry protection function, low water level warning and the current time and temperature settings will be retained in memory even after ‘power off’. The Clifton Food Range equipment is developed and manufactured in the UK by Nickel - Electro, a family run business. The popularity of Clifton Water Baths continues to increase and for many kitchens they have become an essential piece of equipment. Managing Director, Melvin Dickson comments, "We are really pleased to offer chefs this additional size duobath, giving them a wider choice to suit the number of covers in their restaurant. Having the drain taps on the rear of the Water Bath will minimise counter top use for chefs, where space is at a premium in a lot of kitchens."